One of the saddest moments during a soldier’s life must have been notifying family members that a loved one had died. 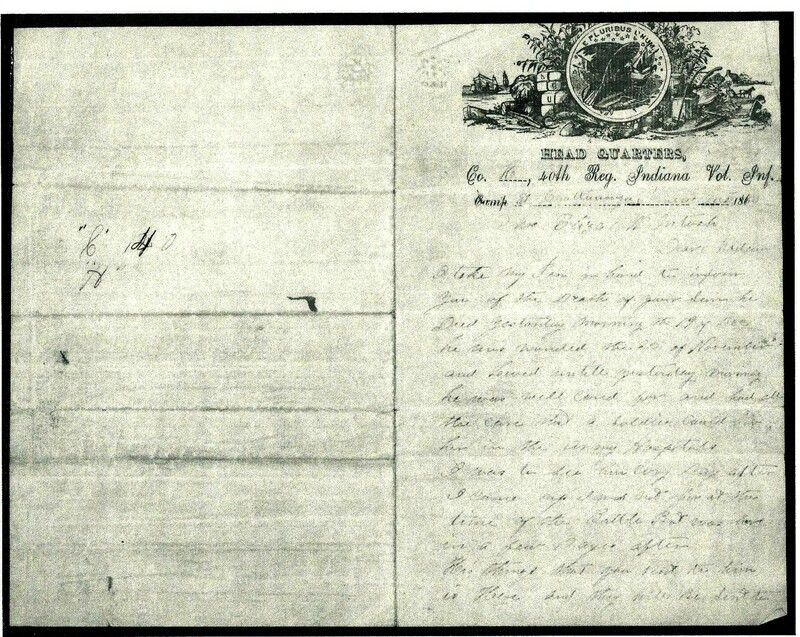 Going through the pension paperwork for Private Taylor McIntosh’s (Co. H) mother, Eliza McIntosh, I noticed a letter sent to her from Chattanooga on a 40th Indiana Infantry letterhead. The news was not good, Private Taylor McIntosh received a head wound during the assault up Missionary Ridge, November 25th, 1863. On December 19th, 1863 McIntosh would die of his wound in one of the hospitals established in Chattanooga, TN. I am a little confused who wrote the letter, as it has two signatures. The first signature is William Oliver of Company C, he was from Waveland, Indiana, as was Taylor McIntosh. The two were probably close friends before the war and remained close while serving in the regiment. The rolls show William Oliver is later killed during the assault at Kenesaw Mt., June 27, 1864. The second signature is from the 1st Lt. of Company H, John.C. Barnhart. John Barnhart was from Lafayette, Indiana, he mustered in as a corporal in Company H. John was promoted to 1st Lieutenant on December 14, 1862. The muster roll shows Barnhart resigning on November 22, 1863 before the Missionary Ridge attack. He is still in Chattanooga almost a month after resigning from the regiment, possibly waiting for the paperwork to go through. Some of the content in the letter makes me believe that William Oliver is the author of the letter. At the end of the letter is the statement, “as I Rite (wrote) to you a few days ago” and he wanted Eliza McIntosh to correspond back. If Barnhart wanted Eliza to write him back, he gave no forwarding address to Lafayette, and does not mention resigning. 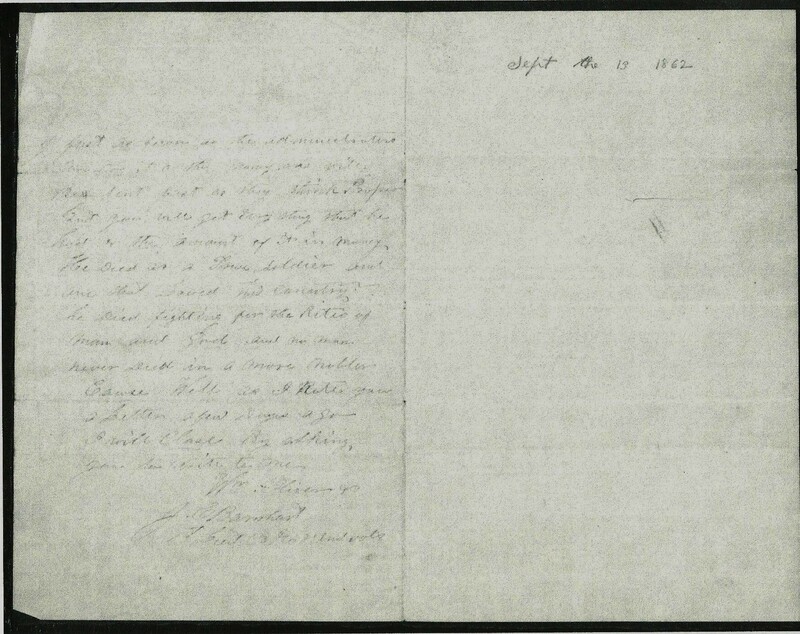 Lt. Barnhart could have put Oliver’s words down on paper, or the two were close friends with McIntosh and composed the letter together on Barnhart’s 40th Indiana letterhead. I have tried to keep everything the way it appears in the letter. Not many punctuations were used. Co. H, 40th Reg Indiana Vol. Inf. Died yesterday morning the 19 of Dec. This entry was posted on April 2, 2012 at 1:03 pm and is filed under Missionary Ridge with tags 40th Indiana Infantry, Eliza McIntosh, John C. Barnhart, Lafayette Indiana, Missionary Ridge, Taylor McIntosh, Waveland Indiana, William Oliver. You can follow any responses to this entry through the RSS 2.0 feed. You can leave a response, or trackback from your own site.